Some good initiatives have been launched. The government has persuaded some opposition politicians who boycotted political institutions after the post-election fighting to return. Legislators promise to keep spending in check by reviewing it every three months. Those who want to run state bodies will now be tested by officials on some basic skills, not just their political connections. Logging and mining contracts worth billions of dollars will apparently be reviewed. But there is no sign that the country's vast mineral resources will benefit more than a lucky handful. Few of the taxes that are paid actually go into the state coffers. A Western diplomat estimates that direct benefits to the state from mining totalled a paltry $32m last year, though Congo-based copper-mining companies alone have made hundreds of millions on stock markets in recent months. Parliament has adopted a budget for 2007, albeit more than six months into the year. But the government may struggle to lure back donors after mismanagement led to the suspension of many lending programmes agreed on last year. 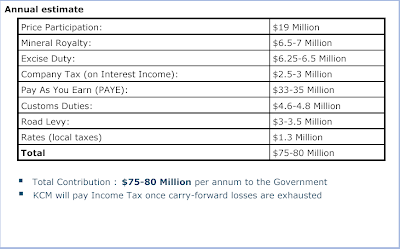 The budget this year, for a country of 60m-odd people, is a meagre $2.4 billion. Zambia, where power to customers like Mwale is rationed almost every day, is a template for such problems. Barely 20 percent of households are wired for power - only 3 percent in rural areas - but the Zambia Electricity Supply Co., known as Zesco, is signing up 10,000 new customers a year, said Christopher Nthala, the utility's transmission director. Now Zambia is getting a push: A global commodities boom has jolted its moribund metals industry to life. Investors are building two smelters, and doubling the capacity of another, to handle the boom in copper, nickel and other metals, taxing the nation's power supply. "We've never seen this kind of growth before," Nthala said. Once the utility could make up shortfalls by buying power from other utilities in the Southern Africa Power Pool. But now, Nthala said, neighbors have little surplus to hand out. "Sometimes we get it," he said. "Sometimes we don't." None of that mollifies customers, who say blackouts are so common that service in much of Lusaka has become totally unreliable. Many power failures seem to hit Matero, a poor township that is home to maybe a million of Lusaka's estimated three million residents. "Every day - it's either in the morning, when people are going to work or preparing to cook, or in the evening, the prime time when I'm tired and I need to go home and listen to the news and cook my supper," said Bishop Peter Ndhlovu, who leads the 250,000-member Bible Gospel Church, an evangelical movement. The above extract is from International Herald Tribune's fascinating article Energy shortage hampers development in Africa. I am sure there's an opportunity here for Zambians at and abroad this time to step in and put some loan funding package together and invest - I sense this could be an investment opportunity that defines the nation in the long term! Are you with me or should we leave it to the Chinese and Equinox? Mines and Mineral Development minister, Kalombo Mwansa, said Government was revising the 1995 Petroleum Act because it was inadequate. “We have the 1995 law which is not progressive. When we scrutinised it in accordance with the international structure, we felt it was not adequate,” Dr Mwansa said. He said in an interview yesterday that Government wanted a law, which was in accordance with the international structure to benefit locals. Dr Mwansa said it was the trend in most countries, when oil and gas was discovered, to look at the provision of the law. “You have to look for the best law that could exploit that resource in the industry. Oil is so emotive that is why you have to ensure that you protect the interest of the locals,” he said. Dr Mwansa, who is also chairman of the committee on Petroleum, could however not give the period for the completion of revision of the law. Three districts in which traces of oil and gas were confirmed, had been divided into 16 blocs measuring about 40 kilometres each. The districts are Zambezi, Kabompo and Chavuma.Meanwhile, the minister has reiterated the suspension of issuance of mining operating licences until end of December 2007. International companies from Britain, Russia and United States of America have shown interest in prospecting for oil and gas. We found that increasing the size of the body increases the cost of successful vote buying when there is only a single interest group seeking to influence the outcome. In contrast, when there are competing interest groups, larger voting bodies may actually be cheaper to buy than smaller voting bodies. It is often said that the cure for vote buying is to expand the size of the electorate. If you double the eligible voters you can raise the cost of successful corruption. This intuition relies on the direct effect that such an expansion of the electorate has on the costs of a single, monoposonistic lobbying party. While the size of the bribes remains the same, the lobbying party will have to bribe a larger majority of the electorate than before to achieve the same outcome. What Morgan and Vardy seem to demonstrate is that competitive political processes like multi-party elections, introduces a “strategic” reason for bribing voters that is absent in non competitive process (e.g. one party elections) – making that direct effect less potent. For us in Zambia, the lessons might be two fold looking towards 2011: a) simply increasing the number of registered voters is not a guarantee that the outcome is more representative of the people’s true wishes; and b) increasing competition among political parties does not always mean that the voters wishes are reflected in the political processes - more electoral competition may just mean more corruption as they seek to out do each other! To really make progress against electoral corruption, we should strive to develop policies that strength the institutions that oversee the electroral process. Considerable effort should be spent on taking forward some of the recommendations of the Mungomba Draft Constitution (para 112 – 119) on structural reform of the ECZ. Essentially the ECZ should be independent of the Executive and appointed by the Appointments Committee, which is appointed by the National Assembly. On a broader basis, the Copperbelt in northern Zambia and the southern Democratic Republic of Congo, has the potential to produce two million tons of copper a year within the next 10 to 15 years. This would require investment in infrastructure, communications, and mine construction, in excess of $20-billion. This means the Zambian economy will be triple its current size in 20 years time.....the expansion is not only in mining, there are also deals in construction and agriculture, totalling investment of over $30-million, which would be completed by the end of 2007. In Zambia, African Energy Resources Ltd is bullish on finding uranium and says any deposit could be developed much more quickly than back home in Australia, where there is political opposition to new uranium mines. "We're looking at nearly 1,000 km of strike length through this area, with occurrences all the way through it and we've only started to scratch the surface of it," Cooke said. The firm's most advanced project is Njame North, where an inferred mineral resource of 5.5 million tonnes at 400 parts per million of U3O8 has been identified. Unpacking Zambia’s land related corruption…. “Generally, development has suffered in that service land has become scare against increased demand. This shortage has caused unorthodox methods of land allocation to emerge, which have resulted in the proliferation and growth of unplanned settlements without basic services such as roads, water, sanitation, refuse disposal and electricity. Further, as demand for land has increased, even those entrusted with the agency to manage land matters at local level have fallen prey to corrupt tendencies. Worse still, there have been allegations linking the Office of the Commissioner of Lands to land allocation using underhand methods”. In these two paragraphs Maurice conveys a frequently overlooked point : not only is land reform important in dealing with issues related to urban development and lack of housing as I have argued here, but it is also at the heart of eliminating corruption. You cannot simply legislate against land related corruption or fire corrupt people, and hope to get better ones (the so-called “dedicated fellow hypothesis”). The real solution is to eliminate the opportunity for being corrupt. The scarcity of land in urban areas (which drives up the benefits of corruption to the administrators) and the opportunity to be corrupt (due to weak allocative mechanism) acts as self reinforcing dynamic mechanisms that can only be shattered through adequate land reform. And that land reform requires simultaneously dealing with the scarcity of land and the inedaquacy of the current land allocation mechanism. Henderson also said Mopani had in principle agreed to renegotiate development agreements with the government, which plans to raise mineral royalties to 3.0% from 0.6% and corporate tax to 30% from 25%. 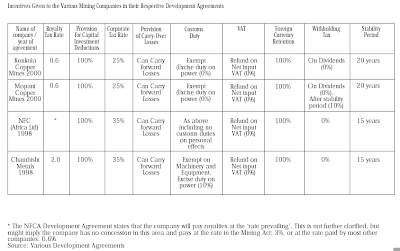 "In principle, mining companies are willing to renegotiate the agreements. Any future change in the rate of mineral royalties should be linked to copper prices," Henderson said. I sense Mr Henderson is playing Jedi mind tricks. The last sentence "Any future change in the rate of mineral royalties should be linked to copper prices" can do with some clarification. Does he mean he favours existing mineral royalties but linked to future changes in copper prices? or does he mean he accepts the principle of a "windfall tax", in addition to the existing "mineral royalties"? “Very differently from the recently emerging consensus about the sources of comparative advantage within the Americas, we find a positive association between economic (land) inequality and long-run development and long-run development. Municipalities with greater land inequality are those that supply more public goods and are more educated and urbanised today. In contrast, we find a relatively robust negative relationship between political inequality and economic outcomes. We also showed that powerful individuals appear to have been much more likely to become landowners and to have increased the value of their lands substantially. Our interpretation of these results is that in weakly institutionalised polities, such as 19th century and 20th century Colombia, economic inequality may be a useful counterbalance against the most rapacious policies that may be pursued by political elites. This interpretation is consistent with the negative effect of political concentration (inequality) on long and medium-term outcomes in Cundinamarca, with the evidence presented by Bates (1981) for Africa, and with the additional results we presented above, suggesting that inequality among landowners, not overall inequality has the positive effect on various economic outcomes”. This rich conclusion has left me pondering on a number of areas - one of them being Zimbabwe. We always need to be cautious in taking new results and applying them elsewhere, but I can't help thinking over the obvious question : is it possible that Zimbabwe actually performed well before the land grab because the large presence of rich white land owners actually provided the necessary counter balance to Zanu-PF in the absence of weak institutions? In effect the white land owners probably acted a "bulwark" against a corrupt Zanu-PF elite, which helped drive the country forward. Its a controversial view, but certainly it is the case that once Mugabe grabbed the land, that balance of power was broken, and what then emerged was possibly a more equal society (?) but full of “political capture”. The corrupt Zanu-PF elite possibly exploited their new found dominance to generate rents for them. They were able to do this because the society was "weakly institutionalised". The historical lesson here might be that Zimbabwe should have first strengthened its institutions (e.g. the constitution) and then redistributed the land away from rich white farmers. Doing the latter first created a dangerous vacuum that Zanu-PF exploited, and of which we may be seeing the consequences of now. There have been a series of calls for the government to reduce the international gateway license from 12 million U.S. dollars and allow the private sector to apply for their own gateway. Currently, private mobile operators have to reroute their international calls through state-owned Zamtel, which has exclusive rights to the Mwembeshi Earth Station and charges usage fees. The issue of liberalizing the international gateway has been subject of discussion of late and there are arguments that it promotes anti-competitive practices by Zamtel. Step 2: We restructure Zamtel so that it becomes a company just like any - non of this “code” commercialisation. Proper restructuring. Step 3: We institute a meaningful universal access policy. Government needs to allow free entry into the international segment to new providers that currently are not present in the market, and let the market determine the number of providers. Step 4: We change the ownership models of Zamtel e.g. consider breaking it up in two (Zamtel Int and Zamtel Domestic) and Government can retain the domestic entity or go for the PPP. Yakima has proposed that Zamtel Int can effectively be a firm in which all the industry players can all have stake through an incremental model that keeps in check unnecessary gold plating but provides sufficient incentives for additional gateway capacity investment. Times of Zambia report that Government has finally seen sense and abandoned its previously stated plans for a national airline. When Sarah Sayifwanda was appointed not long ago as Minister of Communications and Transport, she was given a remit from President Mwanawasa of ensuring " the matter of the establishment of the national airline was speedily concluded and brought to cabinet for a decision". Mr Banda latest pronouncement indicates those plans have been rightly abandoned. GOVERNMENT has no intentions of setting up a national airline but will instead create an enabling environment for the private sector to set up airlines.Vice-President Rupiah Banda yesterday told Parliament during the Vice-President’s question time that the Government learnt lessons from the defunct Zambia Airways and would, therefore, not want to repeat the same mistakes. Mr Banda was responding to a question from Chipangali member of Parliament (MP) Vincent Mwale (MMD), who wanted to know whether there were any plans to set up a national airline.“Government believes in public-private partnership and has no intention of starting a national airline,” Mr Banda said. This is good news indeed. As I have previously argued there's absolutely no case for a national airline. Our focus as Mr Banda hints should be creating an enabling environment through greater liberalisation of air travel and reducing the the cost of jet fuel. Fixed-line segment : All international traffic has to be routed through Zamtel's gateway. 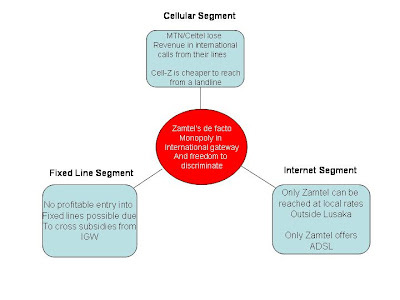 Interconnection fees paid by mobile providers are set at 80% of Zamtel's retail price, which has left no room for competition on prices. With supply constraints, the result is high prices and low quality of service because of congestion. Hence, with a de-facto monopoly on international traffic, Zamtel as a fixed line incumbent operator effectively operates a high-margin, low volume, low-quality business. This status quo is okay for urban households that already in possession of a phone line and for Government departments that do not pay their bills. However, it has resulted in Zamtel's profits not being invested in the expansion the network. Cellular segment: Under the current situation, Celtel and MTN have to route their international traffic through Zamtel's gateway. On outgoing international calls, Celtel and MTN are charged 80% of Zamtel's retail price as interconnection fee for the delivery of the call. The remaining margin is sufficient to cover the mobile operators' costs associated with administration and delivery of call to the international Gateway. MTN, for example, which is passing on 10% discount of Zamtel's international rates to its customers, has previously claimed that it makes an annual loss of $50,000 by providing international calls. These losses are depriving MTN and Celtel from investing in the expansion of their networks at a faster rate. Apart from that Zamtel distorts competition through providing both a fixed network and mobile operator in form of Cell-Z. 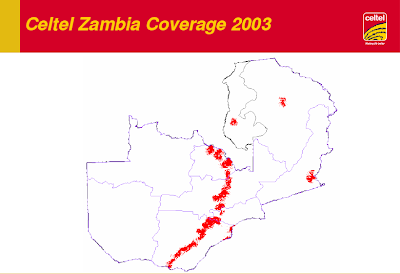 The Zambia Competition Commission in noted this in 2003 in its submission to the Select Committee on Transport and Communication : "the position of Zamtel means that it has the power to prevent, restrict or distort competitor access to this essential infrastructure which was built with public funds". Internet segment: Although internet access is open to competition in general, Zamtel's dominance as a fixed line operator eliminates the level playing field. 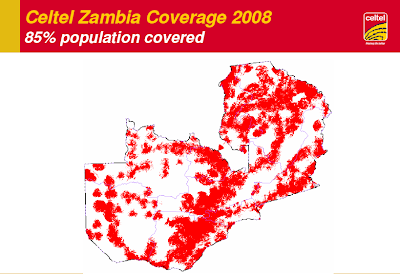 In Zambia most of the internet is through dial-up connections, using the fixed-line telephone network controlled by Zamtel. By controlling the landline infrastructure, Zamtel is able to offer better access conditions to its own internet subsidiary than to competitors. For example, Zamtel ha set up so called virtual local access points, which allow customers outside Lusaka to access the internet at local rates, but these rates are available only to customers of Zamtel Online. Customers of other Internet service provides (ISPs) have to pay long distance telephone charges to access the internet if they are located outside Lusaka. Financial Times carries a fascinating article on Foreign Investors who are betting on a "new dawn" in Zimbabwe once Mugabe goes. Leading the charge is Lonrho, the conglomerate that has been seeking to rebuild the African empire created by the late Tiny Rowland. It announced on Friday that it had raised an initial £32.3m ($66.4m, €48m) from shareholders towards a new subsidiary – Lonzim – to buy up assets in Zimbabwe with a “significant opportunity for future growth”. David Lenigas, Lonrho’s executive chairman, told the Financial Times that he aimed to raise a total of £100m for the company through a share offer to be launched in London soon. We are not going to asset-strip. We can buy big international names for cheap and stay in partnership with locals to drive the business as we have done, for example, in Tanzania and Uganda,” he said. In one case he hoped to acquire a company for roughly a tenth of its 1997 value. One suspects Lonrho and others expect MDC to assume full command and sweep the Indigenisation and Empowerment Bill away. The market tends to know better, but this time perhaps the market should pay much closer attention to the other dynamics we have been discussing here. Government has asked the Energy Regulation Board (ERB) to review the fuel pricing framework in the country. Energy and Water Development Minister Kenneth Konga said the nation would be informed on the outcome of the review next month. ZANIS reports that the Minister disclosed in a ministerial statement presented in the house today, on the fuel supply situation in the country. He said it is essential that the energy sector plays its strategic roles in steering the economy to prosperity as the country strives to reduce poverty and promote economic growth. He said government recently dissolved the ERB and Zambia Electricity Supply Corporation (ZESCO) boards in order to improve their operations. He said it is important that these key institutions are able to meet the challenges of the energy sector by being proactive and innovative. The challenge now is for ERB to deliver a system that can improve the competitive position of Zambia in one of the key areas - aviation. The high jet fuel prices are preventing Zambia from developing its aviation and tourism sectors by keeping the operating costs unnecessarily high. According to ZEGA, jet fuel is 55% more expensive in Lusaka than in Jo'Burg. British Airways last year noted that their fuel costs were more than 40% more in Lusaka than in Jo'Burg. In June 2005 IATA examined the Zambia's high fuel cost prices and compared them to airports in the region, it concluded that Zambia's prices were between 12 and 40% higher. With that came the recommendation that Zambia should try and reduce the jet fuel prices by 20% as an initial step towards achieving a more reasonable and sustainable price structure - no progress has been made in taking this recommendation forward. To make it worse, Zambia also imposes VAT tax of 17% and 5% import duties. There's a case for reducing these for airlines if we are really serious about encouraging growth in the aviation and tourism sectors through cheaper travel. The much much sought after Zambia Draft Land Policy drafted sometime back in October 2006, is now available on the new Ministry of Lands website. Thought it might be useful to point to the insightful ODI paper on previous Draft Land Policy document. The 3rd Quarter ZIPPA Journal is out focusing on Land. I have not read it in full but it looks good. Good to see ZIPPA tackling this important issue. Its not yet available on the ZIPPA website but you can download it here. Albidon Limited said it has intersected significant uranium mineralisation through drilling at the Gwabe prospect in Zambia. The company said results from an initial 25-hole reconnaissance programme confirm the presence of uranium mineralisation that may be amenable to open-pit mining. Could Zamtel's incredible inefficiency in the sector actually be fuelling a growing giant in shape of Celtel? That may not be good news for the future in face of a weak regulator (Communication Authority of Zambia). Two or three years down the line Celtel may possess a lot of market power which are best anticipated now and handled with a liberalisation of the international gateway and necessary break up of Zamtel in two as we have argued here. The source for these pictures and other Celtel related information can be found here. Celtel reached 1.5m customers in June 2007. More information can be found here. Only 2% of KCM's mining taxes are local - assuming all of it goes to the local people (?). An extremely low percentage figure. The source for the numbers above can be found here. "The presence of low grade copper is one of the main reason Lumwana whose copper was discovered 70 years ago stayed without being explored because it needed a huge capital investment". Just one of the many fascinating facts from an interesting piece on Lumwana - a Levy Legacy. Worth adding that with KCM projected to produce 500k tonnes of copper annually by 2010, and Lumwana easily matching that on its own, I sense production records are about to be broken. Its not easy to argue against the "Levy Legacy" tag on 'production' grounds. The Chamber of Mines have joined the increasing calls for further liberalisation of the international gateway, as the following extract from the Daily Mail shows. However, in the same article, Zesco appear to reject the Yakima proposal for incremental ownership on "security" grounds. The Chamber of Mines says the high license fees demanded by Government for the international gateway was adding up to the high cost of doing business in Zambia. Chamber of mines chief executive officer, Fred Bantubonse, said this in a contribution to Zambia Business Forum, e-conference on factors affecting cost of telecommunication services in Zambia. And Zesco’s manager for the optic fibre project, Nang’alelwa Sitwala said losing total control of the International gateway especially if wholly owned and controlled by foreign entities was a national security matter that should concern every one. Mr Sitwala said it was important to mitigate negative implications of liberalisation by allowing only two additional gateways with majority shareholding of Zambian operators....... Mr Sitwala suggested that mobile operators should not be allowed to bid for international gateways operators but allow the operator to carry international traffic for mobile operators. I find Mr Sitwala's argument incomplete. It is difficult at this stage to assess what exactly Government is worried about with respect to shared ownership. What are these security concerns? As I have previously stated if such concerns exist, my view is that these are best dealt with by using the latest technological developments in security devices and imposing proper license obligations and conditions on Zam-Int and other domestic entrants to the market. In particular, with the convergence of networks and services, the Government needs to devise appropriate cyber-security programs to deal with the challenges posed by the information society without compromising consumer privacy. But the need to address these challenges is not an excuse to delay making the market more open. BBC News reported yesterday that Swiss banks are planning to give some of the stolen cash back to the DRC. I think they should not give the cash back as the Kinshasha Government want. Whatever amount the Swiss are planning to give up, it should be given back as infrastructure spend. Incidentally if Swiss Banks were told that any money they give back would be in form direct infrastructure, they would probably be more willing to give back the whole lot. The Swiss are not stupid - like everyone else they probably suspect that handing millions back to a corrupt Government would not actually make any difference on the ground. It'll simply move from the late Mobutu account to a new mini Mobutu's account. Its Kabila's dad who after all said "all it takes to start a war in Africa is $10,000 and a satelite phone". Interesting BBC News article on Ethiopia's high speed hospitals. An idea suggested to me by my brother almost two years ago for Zambia. Good to see that the AU has embraced the model and that 23 other African countries want to try it out - I can only hope that Zambia is one of the signatories. One question : why can't this be duplicated for other professions such as economists, IT experts, etc as a way of helping mitigate the brain drain problem? Admittedly, the Government has done a lot in supporting these institutions. Funding though inadequate has increased. The money is not enough because the number of people going into university now keeps rising against the original planned enrollment levels. In fact, a lot more others with excellent results are left out because there is simply no longer any room to squeeze them in. I would go beyond the Editor's immediate observations. The constrained supply of university has also led to poor quality in higher education. The excess demand in higher education has led to the mushrooming of poor and unregulated alternatives to the two universities (CBU and UNZA). Desperate students who cannot get into these two universities and cannot go abroad to study (which is another problem if they never return) often find themselves paying extortionate amounts of money just to get into "B class" colleges offering "accredited" degrees from foreign universities carrying popular but meaningless brand names. Its not uncommon to hear of "accredited" institutions without credibility which are later shut down for misleading students. The sad thing of course is that often these students are from the poorest of backgrounds - who cannot corrupt their way into UNZA/CBU places or cannot afford to study abroad. Zambia's poor therefore suffer most from the capacity constraint and this does not bode well for the nation's quest to break intergenerational poverty. Constrained capacity is robing the poor while Government stands by! Its my view therefore that the Editor's assessment needs clarification. Private provision is already taking place. It is responding to the excess demand, but the problem is that this private provision is operating in an unregulated educational market. If regulatory standards where high (and uncorrupted) then we would have a better chance of deliver an educational infrastructure that supports a growing economy. Instead what we have are cheap and low quality colleges which are not doing much to get the poorest members of our society to achieve the best returns from educational investment. This is the classic case in which the invisible hands needs some effective direction. A good start would be a clearly defined framework safe from corruption in which Government regulates some of these institutions better to ensure there’s a minimum level of good education being provided. Perhaps what the Editor should have been asking, is why the Government appears to spend less compared to other SADC nations? The other problem we need to deal with is one I have touched upon - corruption. I was surprised when I did a stroll poll among friends, on what they felt was the most corrupt ministry in Zambia. Ministry of Education came top just ahead of Home Affairs, elbowing Department of Health to 3rd place. This could just be perceptions, but there’s a view that whether you get to UNZA or CBU depends not on your ability always but on who you know and how much “side payments” you are willing to make. This undoubtedly does mean that these institutions are not necessarily getting the brightest minds. In a nation in which university capacity is severely constrained the last thing you want is a corrupt and inefficient system of allocating places! On the blog "Right idea, wrong example?" I agreed with Collier's proposal that countries should consider adopting charters that encourage transparency (e.g. external audits) as a way of fighting corruption. What I should have added is that when the issue is primarily tackling corruption and ensuring that revenues are being spent properly, there are a number of approaches that could be used and may be just as effective as Collier's proposal. A good example is the "Alaskan model". The state of Alaska takes a quarter of the money it makes on oil leases and royalties and puts it in an investment portfolio. This portfolio then pays a dividend, each year, to every Alaskan citizen. Alaska set up this fund 30 years ago, and today it's got $36 billion in assets. Last year, the dividend was over $1,100 for every adult and child. Replicating this fund in Zambia would be very, very attractive for lots of reasons. Most of all, it's a clever way to contain the government's opportunities to stick its hands in the cookie jar. Also, since Zambian citizens would profit directly, we would all have an incentive to make sure the copper industry runs efficiently and honestly. Rupiah Banda, says Government will not be rushed into making “reckless” decisions on the mining agreements before renegotiating with mine owners. Mr Banda told Parliament yesterday that as much as Government would like the mining companies to pay more in royalties, there was no way it would demand that they start paying more without following the laid down procedures. Government was also concerned that the current mining agreements did not offer good returns for Zambia and it was the reason a team of professionals was sent to Chile and other countries to study similar agreements with mining conglomerates.“If we rush things we are going to destroy the mining industry in Zambia. We should not make decisions that will make investors run away, so we are not going to force mine owners to start paying more taxes right away without sitting down to renegotiate,” he said. Government did not want to make the existing investors uncomfortable and would tackle the issue with caution and in the interest of the people. He was answering a question from Lusaka central member of Parliament, Guy Scott (PF) who wanted to know how far Government had gone in re-negotiating the current agreements. Gallup's latest "happiness assessment" apparently shatters the notion that you could be poor and happy! See the map from the Economist Magazine below showing that most of Africa is apparently less happy compared to the rest of the world - based on a question to people on whether they considered themselves happy or not. I am skeptical, but here is the map anyway! I had a very fascinating discussion with some Zimbabwean friends this week on the precarious nature of any post Mugabe transition. In debating the key relative merits of changing the current regime - the key question is whether Zimbabwe will be stable if Mugabe leaves, and what can be done to ensure that nation holds together. Its not really an issue that has been discussed in the media at length. Everyone has focused on getting rid of "Bob" - but, will MDC be able to hold the country together? "The MDC will respect all legal land title deeds and ensure that the financial and legal rights of such landowners are fully respected and enforced. Existing landowners will be encouraged to resume farming as soon as possible and will be given every assistance to do so. Special Courts will be set up in all major centers to assess compensation claims for losses incurred during the “fast track” land reform operation and the State will be responsible for such claims. These Courts will also deal with disputes over land rights." I am slowly gravitating towards the wider view that MDC plans to turn the clock black or at least will have no choice but to do so. This is likely to be dangerous for Zimbabwe. Indigenous people will not react very well to being told to give up their land while the Land Commission is doing its work. If on the other hand the MDC decide not to give the land back to previous landowners this is unlikely to go down well with the international community. Most of the people who lost their land during the "Mugabe reforms" have put heart and soul in the MDC with the view of getting their share back, although admittedly most of the white farmers have relocated to Zambia and elsewhere. However it remains the case that MDC has large support among previous landowners. Its unlikely that these land owners would support MDC getting cold feet - in theory of course MDC can promise to give the land back and then renege on it - however that assumes that MDC is distinct from the land owners to allow such dynamic time inconsistency to take place. The current view is that MDC whilst it retains indigenous support also has a large element of backing from white Zimbabweans. And of course international pressure would ensure that they delivered where Mugabe supposedly "failed" on the land issue. So either the MDC position as stated on their website is not credible, in which case questions can be raised over their whole approach, or that it is what it says on the tin - namely turning the clock back. In which case there's a recipe for disaster in store for Zimbabwe. The second challenge for the MDC is what to do about the military. Under MDC there will be a clear divergence between large elements of the military and the Government. Which is not the case at present. MDC must give some thought to how they will solve this situation. Courting support from the army is going to be very difficult for the MDC. Although it is possible for one to imagine what a Zimbabwean friend calls "a scenario in which MDC's post-election policies was all-inclusive, with the carrot being extended to satiate the police and army's top lieutenants", the real challenge remains on whether MDC can achieve this "all inclusive" strategy. In other words policies that "makes everyone happy". Ultimately in such a game theoretic scenario, the key is the perceived weakness of the relevant players (a new Government versus the military). We have seen this in Ivory Coast and other places, where change has not happened because the generals perceived new Governments as weak. If the generals perceived that MDC is weak...a new leader may not be far off. All of this is bleak of course, and to some extent speculative, but it also illustrates why as Africans we must constantly assess the present in light of the future. We can no longer afford to suffer from what Collier calls the syndrome of the "headless heart". So I put this question to my Zimbabwean friends to see what they thought. Their response was quite interesting. Everyone accepted that it indeed was tricky and a real issue to consider. But in typical laid back African style one responded that it was not difficult to solve : "whoever was in charge simply needs to put relatives as generals". Good old African family ties would come to the rescue! Transparency and other things would need to be sacrificed to achieve the kind of stability that Zimbabwe may need post Mugabe - it turns out nepotism has its advantages! I am not totally convinced by the proposed solution, but I do think it carries an important lesson. Very often Western nations expect a genuine democracy to emerge out of desolation (e.g. post Iraq) but that's not always possible and sometimes unconventional approaches should be sought. To be fair there are people in the West who understands the difficulties of political transitions in Africa. Collier's recent book the Bottom Billion is a classic example. If he was asked what would need to be done to solve this post Mugabe puzzle, he would probably say that the West needs to prepare for a relative small force to "guarantee peace" - in the same way the British intervened in Sierra Leone, they could do the same thing in Zimbabwe just to smooth things over and ensure whoever is in charge can take forward policies on a more secure platform. But I suspect, that faced with a choice between "forgoing" your sovereignty and temporary nepotism - most Zimbabweans would probably choose the latter! Our hopes and prayers must remain that they never have to make that choice. "The solution is to make these governments more accountable in spending their money, but how can that be done?....In his recently published book.....Professor Collier favors an international charter — some widely publicized guidelines that countries can voluntarily adopt — to give transparency in spending wealth from natural resources. A country would pledge to have formal audits of its revenues and their disposition. Imagine Price Waterhouse Coopers auditing the copper revenues of Zambia and issuing a public report. Professor Collier’s proposal at first glance seems toothless; a truly corrupt country probably wouldn’t follow the provisions of the charter, which, after all, is voluntary. Yet citizens could pressure their government to follow such a charter, and the idea of the charter would create a focus for political opposition and signify international support for concrete reform." Tyler Cowen is right to praise Collier's proposal that countries should consider adopting charters that encourage transparency (e.g. external audits) as a way of fighting corruption. But Professor Cowen has used the wrong example. Zambia has no revenues from copper to audit. The world thinks now that the Zambian copper industry is booming we are sitting on tonnes of revenues! That is not the case. Considering we get $9m from mineral royalties, a PWC audit would take away half of that given the fees these consultants charge! Today, as I sip my Rwandan gourmet coffee and wear my Nigerian shirt here in New York, and as European men eat fresh Ghanaian pineapple for breakfast and bring Kenyan flowers home to their wives, I wonder what it will take for Western consumers to learn even more about the products of self-sufficient, hardworking, dignified Africans. Perhaps they should spend less time consuming Africa disaster stereotypes from television and Vanity Fair. I suspect Paul Collier may be next. I have just finished reading Paul Collier's book the Bottom Billion where he concludes with a rather cheap stab at Easterly "Easterly is right to mock the delusions of the aid lobby. But just as Sachs exaggerates the pay off to aid, Easterly exaggerates the downside and again neglects the scope of other policies. We are not as impotent and ignorant as Easterly seems to think". Aside from that I recommend the Collier book as it has some interesting new insights on what keeps countries from developed. Most relevant to Zambia [not mentioned in the book] is the discussion on the landlocked trap : being landlocked and surrounded by poor unstable neighbours may be what has held us back from making progress. I met Collier at a conference three years ago when he lectured on the Challenge of Reducing the Global Incidence of Civil War. A nice chap overall - clearly well travelled. Although I suspect the Harare Government will disagree with me after reading his new book - among other things, he advocates military intervention to rescue failing states, after having estimated that costs of a civil war is $64bn while a cheap intervention like the British carried out in Sierra Leone is considerably cheap to mount. The numbers look very persuasive. Governance....how has Mwanawasa performed so far? The latest World Bank indicators on governance provides a new and exciting opportunity to assess how well President Mwanawasa has performed since he took charge towards the back end of 2001. We know that Africa as a whole has improved, especially in the area of corruption, but how far has Zambia progressed under Mwanawasa's leadership? In answering this question, my aim is to provide a short non partisan progressive appraisal of Mwanawasa's leadership in the area of governance over the last five years as indicated by the World Bank's newly publicly available data. The table below from the World Bank database tells the story of Zambia since 2000 focusing on six governance indicators, as released today. The percentile rank indicates the percentage of countries worldwide that score below Zambia. 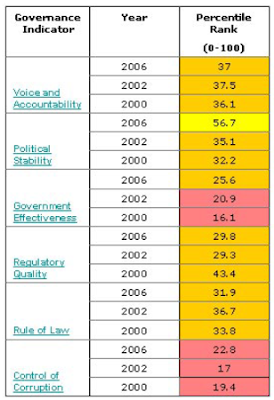 So if we take a rank of 37 in 2006 on "voice and accountability", what it basically says is that 37% of countries scored worse than Zambia on this score and 63% were better than us. So this measure is very much a relative measure on how well we are doing with respective to other nations. A quick scan of the table provides a rather interesting mix of the good, the bad and the ugly in President Mwanawasa's performance. The good news is that since Mwanawasa assumed command, political stability has drastically improved. In 2000 before Mwanawasa came to power, 68% of nations were more politically stable than Zambia. Fast forward to 2006 and only 44% can make that claim. The dramatic change over such short period cannot be by accident. Clearly Mwanawasa has done "something" to encourage greater political stability. The increase in political stability is good news because foreign investors like political stability. It reduces the risk of their investment. From Zambia's perspective, it also encourages the right sort of foreign investment. If you can think of foreign investors as falling in two camps : goodies and the baddies. The baddies like war zones and corrupt regimes because that is where they do shady deals. The goodies are attracted to nice calm places and stay there for long. By Zambia being politically stable we have more chance of getting a greater pool of the good investors, which is a good thing in the long term because they tend to stick around and don't cut and run. However, in crediting Mwanawasa with greater political stability, we must also recognise that democracy is naturally consolidating in Zambia and some of that undoubtedly is due to the current Government's openness to engage other political parties and encourage dialogue. But it may also be due to greater political patronage or what someone has called "politics of poverty". In other words Zambia is following the Botswana type of stability where electoral competition is eroded but the country remains at peace. Whether this is desirable or not is a matter of person opinion. Personally I favour greater checks and balances before electoral competition, although it is good for government to change hands once in a while in order to deepen the nation's democratic roots. Another area where Mwanawasa has made progress is on the area of Government effectiveness. Admittedly Zambia is still performing much weaker compared to other nations. In 2006 nearly 75% of the rest of the world was performing better than Zambia. However, in terms of the position he inherited in 2000, Zambia has clearly improved. This should come as no surprise. Government effectiveness measures the "quality of public services, the quality of the civil service and the degree of independence from political pressures, the quality of policy formulation and implementation, and the credibility of the Government's commitment to such policies". Zambia's completion of HIPC point and subsequent debt relief coupled with the greater independence of the Central Bank provides sufficient evidence of the strides he has made in this area. However the low ranking continues to highlight that Mwanawasa has yet to make the big strides especially in the area of public sector reform. I have previously argued that there's more to be done in this area focusing on a narrower Government, more independence of the civil service and the move towards participatory budgeting. Others have called for much more radical decentralisation aimed at streamlining Government and making it more effective. I would add that crucially Government has to ensure that the Civil Service is an attractive area for the best talent to work. In the old days people longed to work in the Civil Service, but as the system became more and more corrupt the best talent were no longer attracted to the civil service and what we are left with is a poor system manned by not-the-best-talent Zambia has to offer. We need to reform and introduce greater competition within it and make it a first class service. That's the good news. The bad news is that despite the supposed strident fight against corruption very little progress appears to have been made in this area since 2000. Indeed between the period 2000 and 2002 the situation appeared to have worsened with more countries performing better than Zambia in controlling corruption. It does appear that in the initial reign of President Mwanawasa, Zambia's fight against corruption stagnated or did not improve as much compared to other nations. 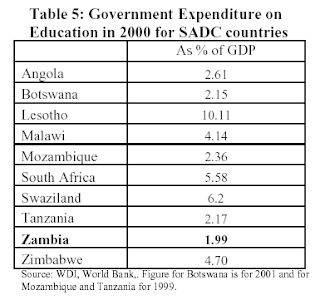 Its therefore interesting to note, that between 2000 and 2006, Zambia only gained on 2% of other countries. That is to say it overtook 2% of other nations in the fight against corruption, of which all of these are nations are among the worst performers in terms of corruption. Its therefore fair to conclude that Zambia is not making the sort of progress we have been led to believe in this area since President Mwanawasa took over. What could be the reason for this apparent stagnation? My initial view is that this is partly over emphasis on corruption fight itself. The media fixation with the Chiluba trial has probably meant the nation as a whole as lost focus on the fight against corruption. In the blog corruption wars, I argued that the key focus should be on institutional reform which would help put sufficient checks and balances in place, and not pointless witch hunts. There's no doubt that the lack of national wide institutional reform in form of a more robust constitution, lack of clear separation of responsibilities between agencies , and absence of more professional and independent civil service is to blame for our poor score in this area. These are the areas Zambia should be focusing on instead of spending money spent on never ending task forces, which panders to the media but achieves very little for the very poor in our rural areas. That's the bad news. Unfortunately, what remains is rather ugly. In the three remaining governance indicators Zambia has actually got worse relative to other countries since President Mwanawasa came to power. When President Mwanawasa took over the nation "rule of law was a big theme". Zambia was going to be a country of laws rather than of men. The World Bank defines the rule of law indicator as "the extent to which agents have confidence and abide by the rules of society, and in particular the quality of contract enforcement, the police, and the courts, as well as the likelihood of crime and violence". In 2000 we were better than 34% of other countries, in 2006 we are 32% better than others countries. Zambia appears to be taking a backward step in this area since President Mwanawasa took over - at the very least we relatively walking backwards! We also find evidence of poor performance in other areas. President Mwanawasa has not made progress in terms of giving people a greater voice ( voice and accountability) and also regulatory quality has declined relative to other nations . Both of theses area are well documented on this blog. In terms of "voice and responsibility" the Government's continuous hold over state media continues to limit people's freedom of expression. We recently heard that a radio station was threatened with being shut down for interviewing the Leader of the Opposition on one their shows. In an era in which we are trying to encourage openness and greater democratisation, there's no place for Government control of what people watch through their television sets and hear through their radios. This is especially the case in rural areas, where ZNBC remains the main source of information. Threatening to shut down radio stations is not acceptable. Much also needs to be done to improve regulatory quality. In communications for example, we have argued for greater empowerment of the Communications Authority of Zambia and similar bodies. Much of that discussion can be found here. So in light of this assessment, how well has Mwanawasa performed in the area of governance, since he took over? The answer is 2.5/6. Out of the 6 key indicators, Zambia has only made substantial strides on 2 - on the key area of corruption that has been celebrated by the World Bank today, Zambia has actually stayed the same relative to other countries. And on the questions of rule of law, regulatory quality and voice and accountability, Zambia has actually performed much worse than other nations since President Mwanawasa took over. The challenge now is for Zambians to realise that we are there yet. Yes we have made a few steps forward since President Mwanawasa took charge, but relative to the general performance of the rest of class we are certainly not scoring a "c" - we somewhere between a "d" or an "e". The good news is that with the new publicly available world bank data, we have no excuse for not holding Government to account in this important area of governance. Let us start today. ZNBC have put more flesh to the story emerging towards the back end of last week on Kansanshi's deal with Solwezi local council. It appears that not only have the locals managed to get an MoU on tax rebates, it appears that they have now succeeded in getting a viable development programme. Kansanshi Mining has approved K1.3 billion for the construction of a Modern market in Solwezi, North Western Province. The mining company has also offered to upgrade Solwezi airstrip to transform it into an International Airport to meet the increasing business in the province. Kansanshi Business Development Manager, Annie Kahingu said that the company is ready to upgrade the airport and that work will start as soon as paper work is concluded. She said the cost of the rehabilitation will be determined once the bids and tenders have been done. Ms. Kazhingu said Kansanshi has so far spent over $50,000 rehabilitating laboratories at Solwezi Technical High School. The President has recently "expressed his appreciation for the public facilities provided by NFCA, the largest Chinese investor in Zambia, saying that Chinese companies are not only important players in Zambia's growing economy but also responsible investors with tremendous contributions to the welfare of local people". To most people, those pronouncements would be easier to take if at the very least the "Solwezi model" was adopted elsewhere. Government has a role to ensure that where local authorities are particularly weak relative to the investors, it provides a framework that gives greater certainty for socially responsible investment. It cannot leave this simply to the local councils to act. Not every local council will have the political will and negotiating skill demonstrated by Solwezi local council. A Human Approach to the "Mining Debate"
An environmental tax on mines?